Pittsburgh Penguins' general manager Ray Shero is beloved by Pens fans and for good reasons. The Pens have been to two Stanley Cup Finals under him, including one Cup victory, and have been near the top of the standings since he's been here. He's made some great signings and trades that not too many GM's around the league have been able to make. What's the best trade that Shero has made so far during his tenure as Pen's GM? In my opinion there is three that you can make a real argument for. No trading for former Pen Alexei Kovalev was not where I was going....Neither was the Alexei Ponikarovsky trade, those are what we call duds. Trading for Gary Roberts was probably my favorite trade that Shero made, and it did a positive impact on the team. And let us not forget the trade express that Shero went on last year, trading for Jarome Iginla, Jussi Jokinen, Douglas Murray, and Brenden Morrow. It didn't work (except for Jokinen) out but it sure was fun. The first "big" trade that Shero made was obtaining Marian Hossa and Pascal Dupuis from the then Atlanta Thrashers. The Pens gave up Colby Armstrong, Eric Christensen, Angelo Esposito , and a first-round draft pick. Hossa played with Sidney Crosby, and the both tore it up in the playoffs, but the Pens ended up losing to the Detroit Red Wings in the Stanley Cup finals. Hossa also signed with Detroit in the following and well you know the rest of that story. Just looking at that trade though, getting Dupuis ended up being the big win for the Pens. Dupuis has been one of the Pens' most important players over the years, helping the team win a Cup, and has become one of the most beloved athletes in this city. And let's face it, the Pens didn't give up anyone worth a damn in that trade. Another trade that Shero made that is close to Pens' fans hearts is trading for Bill Guerin. The Pens got Guerin, who was 38 years-old at the time, for a fourth-round pick. Steal. Guerin was just what the doctor ordered, providing seven goals and fifteen points during the 2008-2009 Stanley Cup run. Points aside, it's noted that Guerin made his biggest impact in the locker room, providing great leadership to a predominately young Pens' team. Guerin played one more year for the Pens after the trade, so he wasn't even just a rental player. Guerin scored 21 goals with 45 points in his last season of his career, which was played in Pittsburgh. Guerin currently works for the Pens a player-development coach. That was a Hell of a trade by Shero. Arguably the best trade Shero has made during his tenure was getting Chris Kunitz from Anaheim for Ryan Whitney. Whitney, a former top-10 pick in the NHL draft, was supposed to be a future Norris Trophy candidate. Spoiler alert: He has never been nominated. Whitney and Kunitz's careers have been the complete opposite of each other's since that trade. Kunitz on the other hand has become one of the best two-way wingers in the NHL, forming unreal and kind of scary chemistry with the best player in the world, Sidney Crosby. Thus ending the "Winger for Sid" campaign. Kunitz went from being a good top-six winger to one of the five or ten best wingers in the NHL. Since the start of the 2012-2013 only Crosby, Patrick Kane, and Martin St. Louis, have more points than Kuntiz. Add in the fact that Kunitz plays a very physical game and solid two-way hockey this trade was a monster steal for Shero. Especially considering that the Pens just re-signed Kunitz to a three-year extension, which is only a $3.85 million cap hit. Ryan Whitney is currently playing in the AHL after getting waived by the Florida Panthers this year. Yikes. That trade is going to be tough to beat. However, in my opinion it may have been topped. In 2011, the Pens traded defenceman Alex Goligoski to the Dallas Stars for James Neal and Matt Niskanen. At the time a lot of people were conflicted about the trade. Goligoski, by some, was considered to be the future quarterback of the Pens' powerplay. He was a skilled offensive defencman with huge upside. That being said, the Pens had Kris Letang and a few other young talented defencemen so Gologiski was considered expendable. A huge need for the Pens at the time was a top-six forward. At the time, both Crosby and Evgeni Malkin were out with long-term injuries. Neal had already grown into a top-line winger in a short time in Dallas, scoring 28 and 24 goals in back-to-back seasons. Niskanen was simply known as the guy that Crosby fought that one time. He was a decent defencmean who had a career-high of 30 points. Both Neal and Niskanen struggled early on in their tenure with the Pens. Hell, Neal, acquired to be a goal scorer that the Pens desperately needed, only scored ONE goal his first 20 games with the Pens. The internet was convinced that the Neal trade was a bust. The internet was wrong. Since the 2011-2012 season Neal has averaged over a half a goal per game, which is really good if you were wondering. Neal scored 40 goals and had 81 points in 2011-2012 and was tied for seventh in goals last season. Neal is currently fourth in the in the NHL in both goals per game and points per game this season. Neal is by far one of the most talented goal scorers in the league and also has developed great chemistry with Malkin. 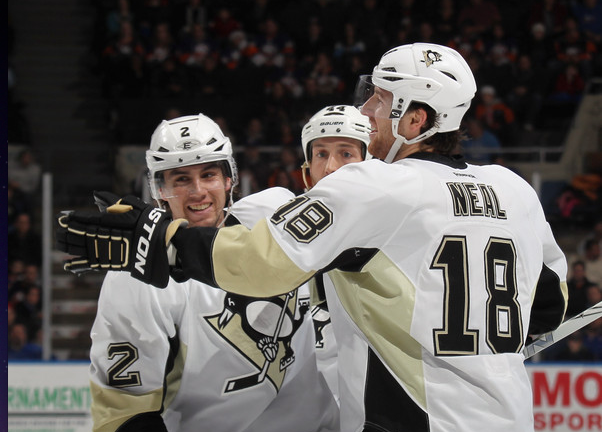 Shero locked Neal up to a long-term deal that runs until the 2016-2017 season. At $5 million per year, Neal is certainly worth that kind of money. Getting Neal heads up for Goligoski was a win in itself. To be honest, I wasn't very big on Niskanen but he has since become a very good and reliable defenceman. This year, Niskanen is one of only two defencemen on the Pens team that hasn't missed a game this year, and also leads all Pens' defensmen with 30 points on the season. Getting Niskanen in that trade has been vital and has definitely made this trade a huge win for the Pens. Niskanen's contract is up after this season. In my opinion, the Pens should do whatever they can to re-sign him. Comparing Niskanen to Gologiski, that should also be a win for the Pens. Niskanen has outperformed Goligoski this season so far, and is a better two-way player. Add in the fact that the Pens are paying Niskanen virtually less than half of what the Stars are paying for Goligoski and it gets even better. If the Pens can win a Stanley Cup this will definitely move as the number one trade that Shero has made as far as I'm concerned. So on behalf of Shero. I would like to thank former Star's general manager Joe Nieuwendyk for making this terrible trade for the Stars, and a brilliant trade for the Pens. RIP Neiuwendyk. He's not really dead but his career as a general manager is. In Shero we trust.